If you are having a tough time managing images in your document, the following tips will surely help you. Majority of the time, we want the images in the document to stick at a fixed position. Images that float are hard to manage. Click the image. The Picture Tools menu group is enabled in Word Ribbon. On the Format tab under the menu Pictures Tools , within the group Arrange, click the drop-down list button Text Wrapping. Click In Line with Text from the drop-down list. The selected image will be fixed at a line in the document. You can click and drag the image to a different line in the document. To place the image at a different position horizontally, place the mouse cursor in front of the image and then use Tab or Space Bar to move the image horizontally to a new position. 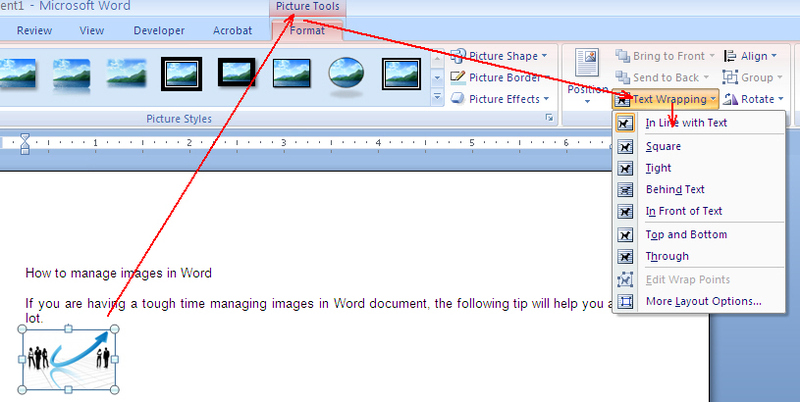 On the Format tab under Pictures Tools menu, within the group Arrange, click the drop-down menu Text Wrapping . Select Square from the drop-down list. Text will be arranged around the image in the shape of a square. If image has an irregular shape (such as a star), click Tight from the drop-down list. Text takes the shape of the image around it. Note: If the image inserted has an irregular shape (such as a star), select the option Tight to arrange text around the shape. Posted on April 19, 2013 by wordknowhow •	This entry was posted in Uncategorized and tagged arrange images in Word, images in word, Square vs. Tight image, Text Wrapping around images. Bookmark the permalink.